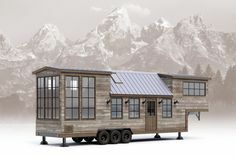 There is a wide range of possible ‘real costs’ of building a Tiny House that depend on how much you are willing to salvage, do yourself, how expensive of taste you have, and how much work you want to source out. *NOTE* We are only about 75% of the way through the build! So this is not a complete list of the TOTAL cost of a finished Tiny House BUT it is our real costs SO FAR. We will share at the end our estimate remaining costs. With that said, lets get to the list part(the fun part, am I right?)! Interior 3D Model – This shows the interior plans of the Tiny House in 3D space using Google Sketch Up. We’ve only done the VERY basics of electrical so far! The vintage oven we drove all the way to Medford Oregon for. It blows my mind in so many ways to see that number. 1, good job team because…we worked for ALL of that money. 2, wow, that’s a lot of money and still more to go! 3, its really not that much money, considering we own every square inch of that house. This would put us barely over our goal budget of $20,000! What do you think? Have you considered building your own Tiny House? 20,000 dollars can seem like a lot but that is basically like a down payment for most other houses! While we’ve still got a month or two left of work and a bit more money to spend to get this project done, being able to say we truly own this house will make it all well worth it! Pin this so other people looking to Go Tiny can know the cost, or lack thereof!